After the Battle of Brooklyn - also known as the Battle of Long Island - in August 1776, the American Army under the command of General George Washington, after a harrowing battle escaped the British Army in the middle of the night to New Jersey, leaving New York in the hands of British. The British saw that the resources that southeastern New York could give them in fighting a war against the Americans were extremely valuable and they settled in to occupy several regions. One of those was Long Island from Brooklyn to Queens County (then including both present day Queens and present day Nassau County) to the end of Suffolk County at the Atlantic Ocean. Long Island was put under martial law and a military governor was named. Long Island remained OCCUPIED until the end of the Revolutionary War when the British marched off Long Island and the other occupied regions in defeat. For the citizens, living under occupation was difficult and they faced constant harassment of the British soldiers and officers. Officers occupied houses - allowing families only a small part of their own homes to live in. The Town Of Huntington was the center of British Headquarters and soldiers encamped on the Green. Citizens were often impressed into service for the British Army. Men, women, and children were suspected of spying. The war had come to Long Island and the British were staying on Long Island for the duration. American raiders would come from Connecticut in whaleboats to harass the British and several skirmishes or battles would take place. 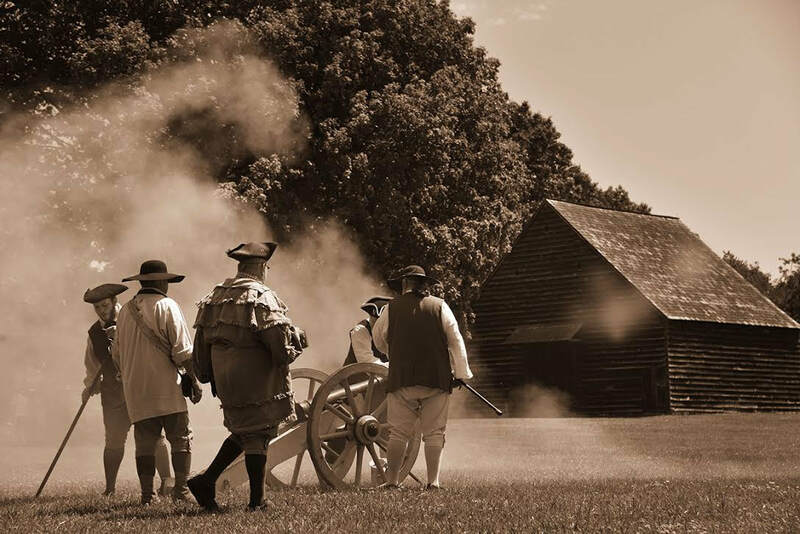 In June 2018, the Huntington Militia and other American and British reenacting units came together to recreate life on Long Island under British Occupation using Old Bethpage Village Restoration as the stage and the public were invited to both see and be part of what took place on Long Island during the British Occupation. This two day event will be repeated annually or biannually. See our schedule for the event. THREE VIDEOS BRING YOU A GLIMPSE OF THE TWO DAYS OF THE REENACTMENT OF THE BATTLE OF LONG ISLAND!